I would love to get the recipe as it looks like something they would really enjoy and I am collecting recipes for an upcoming silent auction at one of my daughter's dance schools and yours looks like something people would definitely want to bid on! 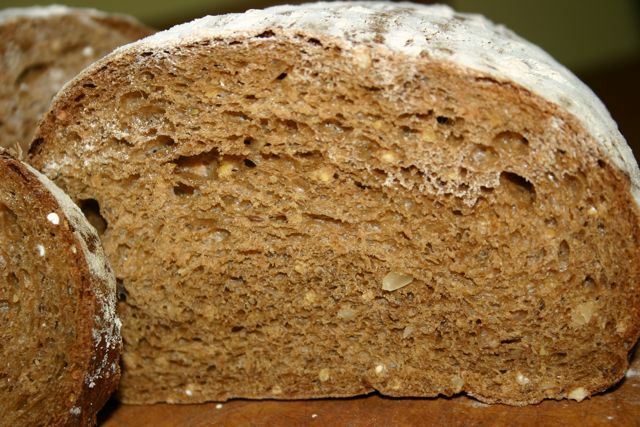 A few wild guesses on the waldkorn - looks like millet and maybe sunflower seeds in the crumb. Dark color maybe rye or spelt? 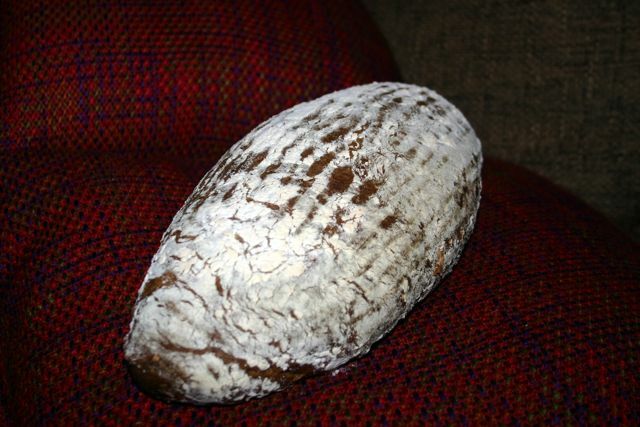 banana bread recipe & how does my waldkorn's crumb get so dark? Cream the sugar and the eggs in a stand mixer on medium speed, until it becomes pale and fluffy, about 7 minutes. Go to low speed and pour in the vegatable oil until fully corporated. Add the bananas and the creme fraiche to the egg mixture. Stir together the flour, the baking soda, the cinnamon and the nuts. 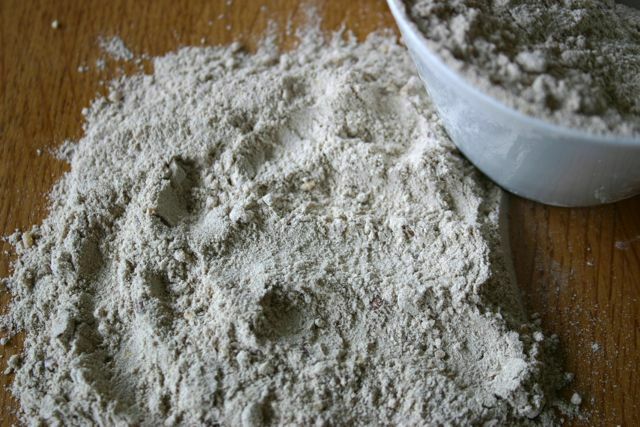 Take the bowl from the mixer and fold in the flour mixture until evenly distributed. Pour the batter in the pan. Put in the oven ( "still" baking, so without blowing air gives me the best result for this recipe) for about one hour, to one hour and fifteen minutes. Check with a wooden skewer if the bread is done. If it comes out clean from the middle, it's done. 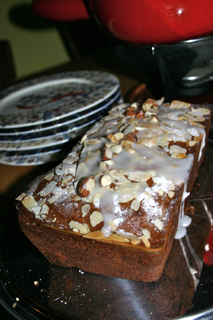 After 40 minutes of baking I took out the loaf to give it an eggwash and sprinkle the flaked almonds on top. Be careful not to burn them! Take it out of the oven when done, sprinkle some more nuts on top of the bread and drizzle some lemon icing over them and let it cool! About my Waldkorn: There is definitely millet and sunflower seeds in it! You can't really see in the picture because I had to use the flash, but the crumb is really as dark as the crust in the first picture, so a really dark dark brown crumb that (I think) can never be achieved by adding spelt or rye flour alone. There has to be something else... but what?! Indeed it does have a lot of sugar. I do usually use honey or agave nectar and I sometimes use applesauce so there are ways I can get around that amount. Plus, I would think the bananas would add sweetness too. Again, thanks for taking the time to print it all out! 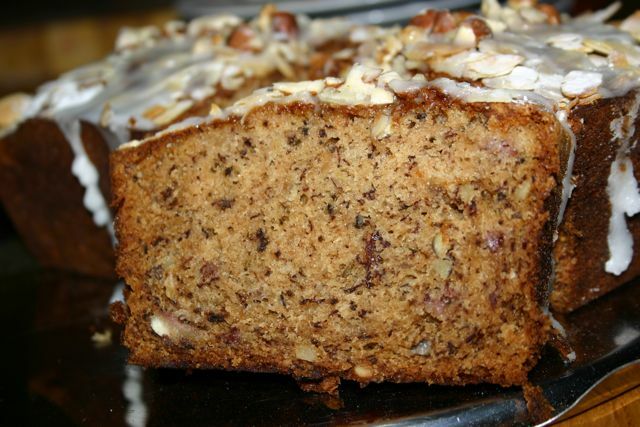 Nice baking, Freerk and thanks for providing that banana loaf recipe, too. Coincidentally, I was just thinking about making banana muffins this week. Is Waldkorn a brandname, then? I found this on the net. The bread looks great, but no breakdown of the flour either. Your guess is as good as mine. It started out as a brandname for the first mass produced multigrain bread in the netherlands, somewhere in the late 80'ies, but has since evolved into the 'free world'. The mix I used is from soezie. Could it be that they added some sort of molasses (in powderform?) to the mix, much like in the pumpernickel bagel, to give it that deep brown color? And shouldn't all this information just be on the package anyways, grrrl ! For Banana Bread lovers, if you want to make a really moist and flavorful bread, reduce the sugar and add a small jar of Marmalade. I do homemade jam and jelly and one of the things that I make is carrot jam and I use it in my cakes and breads and it makes them very moist and wonderful. Levine's Divine Speculaas Rolls recipe 2nd update!!! !